Pictured in front, from left, are Eivynn Woolums, Cole Cline and Evan Scott. 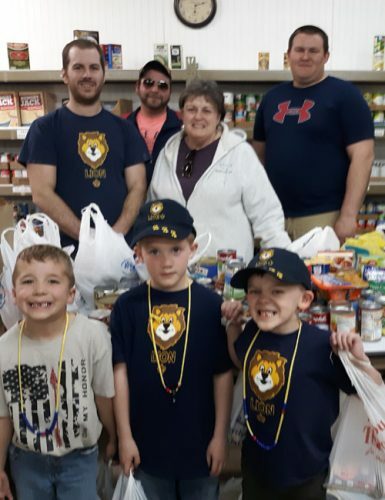 Pictured in back, from left, are Cub Scout Den Leader Trevor Ritter; Robert Woolums; food pantry volunteer Connie Bickel; and Greg Scott. SYRACUSE — Syracuse Cub Scout Pack #3828 delivered donations of food items to Syracuse Food Pantry on Monday, April 8. The Cub Scouts went door-to-door collecting food items. Connie Bickel, volunteer for the food pantry, received the donations.